On Friday December 3, 2010 Katie and I had a most WONDERFUL experience. 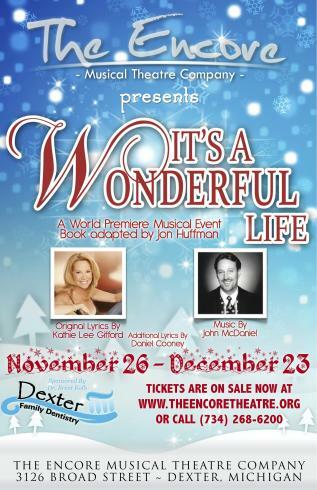 Our son-in-law (that is Jessica’s husband), Dan Cooney has been working on a new Christmas Musical for his theatre in Dexter, Michigan, The Encore Musical Theatre Company, and we got to see the World Premier on Friday night. Dan gained the support of the good people in this Ann Arbor, MI area community a couple of years ago, and raised the money to convert an old warehouse into a lovely, cosy theatre. They are concluding their second very successful year, having performed highly acclaimed productions of musicals such as Evita, Oklahoma!, The Sound of Music, Little Shop of Horrors, Sweeny Todd, Guys and Dolls, Annie, Spelling Bee, Jesus Crist Superstar, Club Morocco. Having had the good fortune to obtain the talent of two celebrities such as Kathie Lee Gifford and John McDaniel was a major boost. Dan has performed with Kathy Lee in shows before, and has also been in shows music-directed by John. Dan is currently in a new production of Bonnie and Clyde, The Musical, with music direction by John. So, last Friday Katie and I had the privilege of driving to Dexter from Columbus to “stand in” for Dan at the World Premiere of It’s A Wonderful Life. But first, we were to pick up Kathie Lee, her assistant, Christine, John McDaniel, and Kathie’s husband, the football legend, Frank Gifford at the Willow Run Airport. We were so impressed with these wonderful people. Frank, a football Hall of Famer and a legend, could not have been nicer. And Kathtie was an absolute hoot. John, so imminently brilliant and talented, and gentle. Katie filmed the curtain speeches… Dan asked me to say a few words. At intermission Kathie asked if anyone was filming the production. I just happened to have my small video camera! The footage is what one gets from filming in a theatre without a tripod and with hot stage lights, but at least it is a record of the second act. I was also able to film both Kathie and John’s comments. This entry was posted in Performances and Shows on December 5, 2010 by wgrove.